Oh friends, it's so easy to become distracted in this world of ours, isn't it? By what is right in front of us. By what is clamoring to be right in front of us. By all that is tugging at our hearts and minds, demanding our attention. And that's not even accounting for our kiddos who are asking for snacks, and reminding us that we were supposed to have washed their pink tights for ballet class...TONIGHT. Things like the mess in my sink, the perpetual to-do list, the Christmas stuff that needs to be properly stored away and is still sitting in a pile in my basement, the dust so thick on the entertainment center that we wrote our names in it last Friday night while we were queuing up a movie...this list is a hundred items long for all of us on any given day. 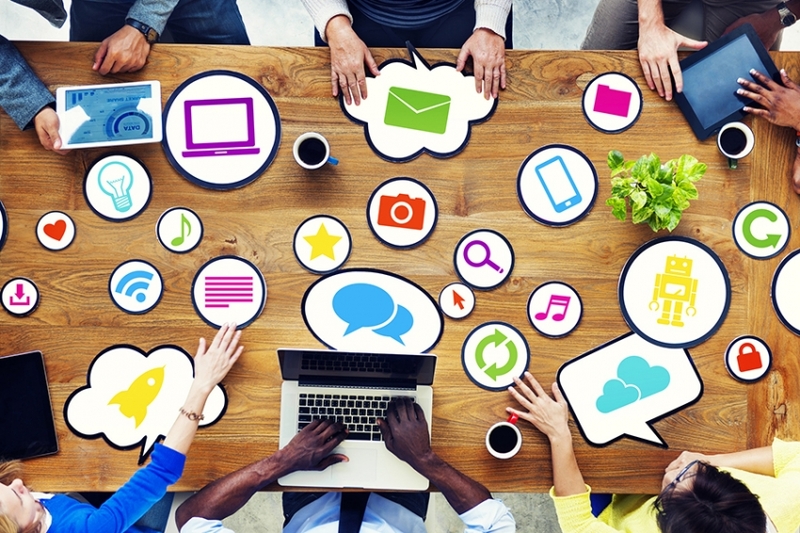 The websites, the podcasts, the television networks, the newspapers, the magazines, all of the social media outlets. They're all clamoring for our attention-- "Read me! ", "Watch me! ", "Click on ME, ME, ME"! 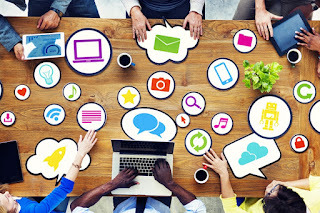 And we give in-- we click, we listen, we read-- and that's not always a bad thing, but that's like saying chocolate cake or a huge plate of nachos isn't always a bad thing either. Too much of an ok thing inevitably becomes a not so good thing...and raise your hand if it feels like there is "too much" of a lot of things sometimes? We know it, but we let the distractions pull us in always, don't we? I do it when I'm tired, I do it when I'm discouraged. I do it when I don't feel like making dinner, or this northeastern winter feels like it's going on two weeks too long. Overwhelm. Discouragement. Anxiety. Depression. Frustration. Anger. Tension. Impatience. Low self-esteem. Who has been there? In any of these places? These are ALL distractions to our days, this yucky list of "feelings"-- they pull us away from intentionally loving, from engaging with our kids, from being a blessing to our spouse and friends-- they even pull us away from mundane things, like successfully doing a load of laundry or just getting the things done that you need to get done, right? Wouldn't you LOVE for your life to be filled with those things instead?! So, what do we do about it? 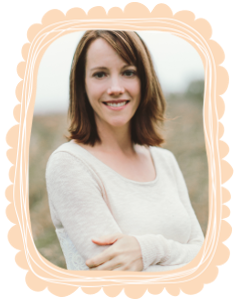 What do we do when our mind starts to wander, when the demands poke at our soul, when our hormones or ugly emotions start to peck, peck, peck from the inside. We could resign ourselves to thinking that things are just always going to be that way. We could listen to the world telling us to try another self-help book, or to buy ourselves something new, or that it's ok to scroll through Instagram because you deserve to do 'something relaxing in your day'. We could engage in whatever numbing behaviors the world promises will temporarily ease our frustrations. We could stop looking at the world and all that is in front of us. All of the images, all of the promises, all of the noise. We could even stop-- for a moment-- looking at all that stands in front of us that is literally bringing us down-- the to-do's, the responsibilities, the things that feel like they're never going to get better, whatever those things are for you. Not on earthly things...the bazillion things that make us feel unsteady. Like we're on a catamaran, out to sea, with nothing solid to focus our gaze on. I don't know about you, but that just makes me seasick! I need to focus on something steady, unmoving, and unchangeable so that I don't feel swayed, weary and seasick. The only unmovable thing I know is God and His truth. There is action involved here-- you have to CHOOSE to do this. 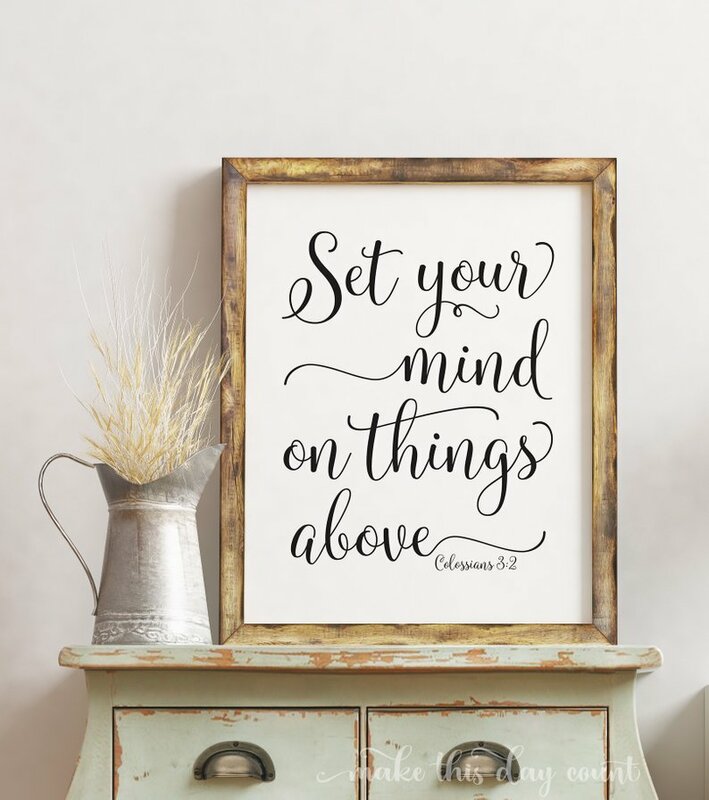 To set your mind on things above-- that means God, His word, His promises. That means making an intentional choice away from the chaos of the world to pray, to read scripture, to praise God for the bazillion blessings around you. Not on earthly things...this is EVERYTHING else! All of that stuff right in front of you, trying to be in front of you, and all that you are feeling inside of you. It's all earthly stuff...it's temporary, it's full of empty promises, and it will continue to overwhelm our hearts and souls if it is all that we look at. Honestly, it's like eating fast food diet everyday and thinking you're somehow, magically, going to wake up healthy. A couple of weeks ago I was invited to speak at a local women's gathering here in town. We talked about finding Jesus in the messes of our lives-- how do we see him, truly SEE him, when we feel confused and overwhelmed. 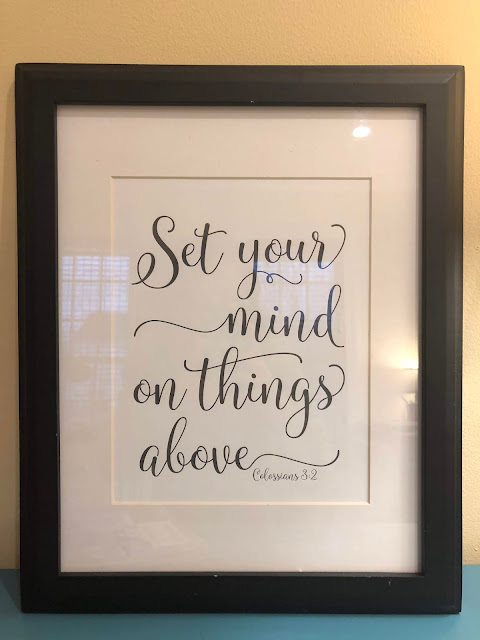 Colossians 3:2 was one of the verses we talked about-- that we need to look UP and not OUT when things feel like they're falling apart. Photo from "Make This Day Count"
I wanted to give the women a tangible reminder to take with them, and found this printable on Etsy in a super cute shop called Make This Day Count created by Melinda Mickholtzick. 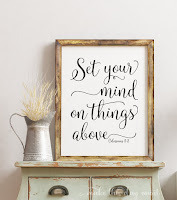 For $2.80 I downloaded this printable, printed it on card stock and framed it to put in my office. She has a website by the same name, Make This Day Count, if you want to check it out. (For the record, I don't know Melinda, so this isn't a publicity thing- I just found her website, and loved her stuff!). I printed copies for the women in the group to take home and do the same (I hope that wasn't some sort of copyright infringement-- if it was, I'm sorry! But, it was all in the name of bringing more of Jesus into our worlds, and it was a small group!). At the time, I wasn't intentionally trying to find a scripture for my office, but it was as if it found me. I found an unused frame in my basement, popped the print inside and took it to the women's group to show them how nice it looked framed. When I came home I figured I might as well put that print in a predominant place in my house because it truly is a reminder that I need to read every day. And, so now, here it sits. On a bookshelf in my office. My office isn't a nice, tidy little space like you see in the picture of some organizing magazine--it's full of life, and paper, and clutter. There is a 60 year old hand-me down corduroy chair in the corner where I read my Bible every morning, and more books and file folders than I can usual keep track of. 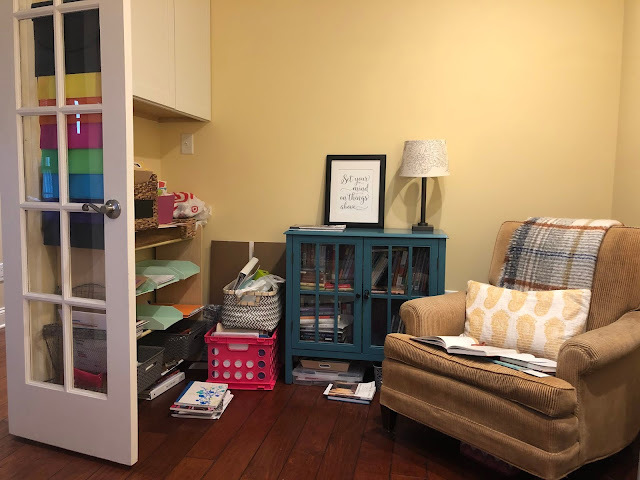 Because I love books, and ideas, and because I have kids who have lots of books, and papers and projects, the space can start to feel like a cluttered artists studio at times with bags, and clipboards, journals, and assignments sheets all mixed willy nilly in no particular order. I don't let it bother me as much. I read that verse. I pause. I ask, "Ok God, what's next? What do you have for me today because I know it's not get all anxious about these papers, or my to-do list, but that you have eternal goals in mind...settle my heart and give me wisdom." And He does. He settles my heart and my spirit in the midst of my day...no matter what is going on. I don't know what this looks like for you today, but whatever is, I urge you to take a deep breath, find a quiet space and talk to God for a few minutes. Read a devotional. Read the Psalms. Ask God to fix your eyes on Him, and what is truly important. Ask Him to steady your heart, and your eyes, in the midst of this overstimulating world that is clamoring for our attention. When you stop looking at everything and everyone else, and focus your eyes on the only thing that can actually steady your soul, you will find a quiet strength that can't be explained. Your heart will be re-centered. Your priorities will become more clear. 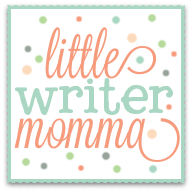 You'll start to ditch the "icky" list of feelings for character traits that don't come easily, but are worth the fight. 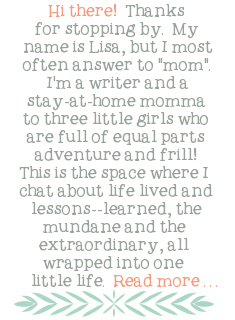 This is a beautiful reminder, Lisa. Thank you!